It began in mid-August: Is it there yet, on the rack? Must not even look, I tell myself. Then I ask Le Duc to check. Every day. This is my heritage, my nemesis: The September Issue. Its spell was cast in my teens. Mom would drive out to camp on August Sunday afternoons. For the first three weeks, she brought clean laundry, candy, and Herbal Essence shampoo. But on Sunday of the last week, she would bring the plump September Vogue. The counsellors fought to read it; by Friday, when I packed my duffle to go home, the issue was creased and smeared with Coppertone. I was more than ready to gorge on Top 40 hits and dispense lanyards to my girlfriends. 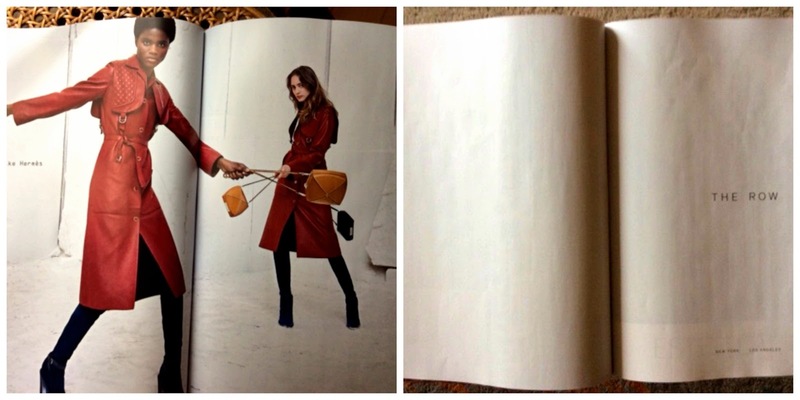 I also returned primed to lust for a Coach bucket bag (how the mighty have fallen). The habit persisted from my teens through thirties, from Villager to Donna Karan. Whether new or consignment, it had to be "that one". In order for an object to confer status, enough persons have to know what they are looking at, so that they can be duly impressed. If a Prada bag fell over in a forest, would it make a sound? Only if the squirrels thought, "Oooooh!" Status is relative. I've known women who do not consider their production Hermès bags anything much; it is the custom-order in an exotic skin that counts. I'm not immune, even though I'm on to the game. When a luxe Italian sportscar purrs down my street, I think, Nice car, man. The things were invented to make us look! What are the current status markers, the trophies and temptors? Open the September Issue to see brands stake out their turf. If you have your head turned, ask yourself if that coat would raise your heartbeat even if you didn't know who made it. And sometimes the answer will be, Si! I visited my friend Alice this summer. In the guest room closet, I shared space with her mother's Pucci tunic, an exuberant swath of silk jersey. The Pucci signature was hidden within the famous swirling print, but fashion-conscious women would have known, fifty years ago, what this was. Mrs. E. felt like a contessa in it; now Alice occasionally wears it to parties. Status brands are practiced seducers; they cannot rely solely on the few who can buy without thought. They employ classic attractors: beauty, rarity (the special edition, the numbered release), quality—and especially their ability to transmit that you are superior and alluring because you have this. Why did I buy this month's Vogue? To see what the culture presents as aspirational, a time capsule of the commercially covetable. Though the cover boasts of "redrawing fashion's map", much of the glossy gear is straight out of the '70s! 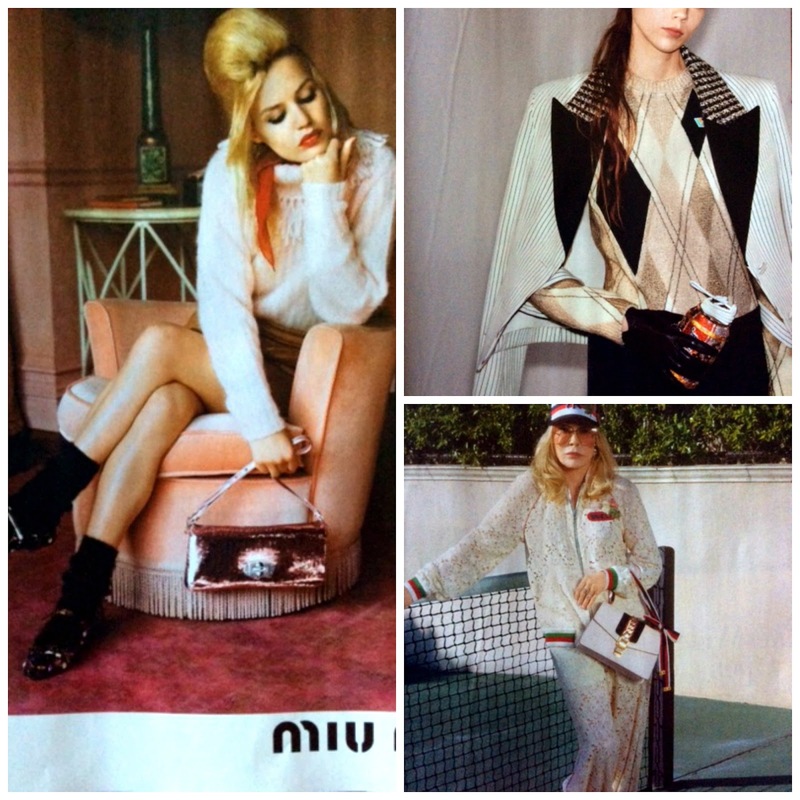 Left: Miu Miu miniskirt and pink glacé bag; top right: Louis Vuitton does shoulderpads; bottom right,: Gucci tracksuit—with a model looking exactly like Faye Dunaway from that era. Hermès put a buttery '70s trench on both pages of its spread, while The Row suggest....? I must ask the Olsens. Will women look like extras from "The Deuce" this fall? The mix of the fantastic and wearable has not changed, though I noticed fewer obvious logos. Hundreds of ads later, there was nothing that I longed for (well, that I could responsibly afford) though I was captivated by this fake fur stole, plush stripes of pungent colour and houndstooth tweed. Not that hard to run up your own version, is it? If you want to Seventies-Up your wardrobe, buy a newsboy's cap, a pair of aviator shades, and tuck a pullover into button-fly high-rise flares. Ring any bells? And "The Deuce" is back, channeling 1977 Times Square style: secretary blouses, jumpsuits and the advent of the jeans cut still loved today. 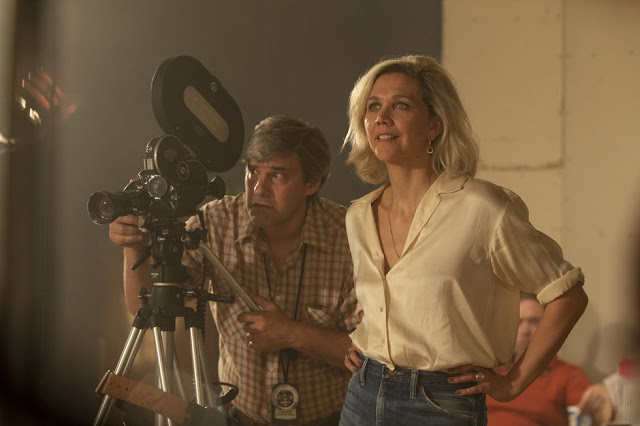 Read Summer Lin's interview with the show's talented costumer Anna Terrazas, who nailed the look for Maggie Gyllenhaal and the rest of the cast, here. Did you watch the Netflix production about the September edition? I loved fashion magazines when I was a young girl. I worked at whatever miserable summer job I could find to get fall clothes. I copied those styles in their least expensive incarnation and I always felt stylish. I doubt that I would find anything that suited now. My daughter bought a "Princess Diana" sort of ruffled blouse in Paris the other day. Definitely early 80's. I find the number of ads in Vogue and other magazines off putting. It seems as if the articles are scattered and hard to find. I really did not find anything exciting in the September issue this time, which was disappointing. It all seemed a redo of former trends. Still, it's fun to look and then move on. It is very interesting to look at those trends from 40 years ago and their upscale incarnations, but I have never bought Vogue. I have certainly perused it when friends or cousins bought it (various editions) but the only fashiony magazine I bought as a young woman was Marie Claire (the original French version; I found the others dumbed-down). I'll certainly flip through it in a library, out of sheer visual pleasure. Indeed, while it is obvious that ads are necessary for glossy magazines to be affordable for non-professionals, they have utterly overpowered editorial copy. Oh yes, each September Vogue issue sends palpitations to my (now almost 70 yo) heart. Over time, there's been a steady improvement in drapable, washable fabrics that look sensuous on any woman of any age. I see that more sensible shoes are in this year (joy!) and that there could be some classics to love for years to come...I'm glancing now at UK Vogue, and there is lovely jewellery by Lillian Von Trapp or Tatiana Verstraeten. Silk, exuberant floral pyjamas by Dolce & Gabbana as well as frou-frou outfits with models in outre poses, not meant for real life, but rather for escapism! The magazine that I can’t resist purchasing once in a while is the British House & Garden or Interior Design. I don’t live in a grand country house with 12 foot ceilings, a velvet sofa would quickly be covered in cat hair but there is something very appealing in English interiors, a sort of eclectic casual chic style of living. Who knows, I might find an Anglepoise lamp to update my room instead of getting a newsboy’s cap to update my outfit. I remember during my during early (and always broke) adulthood being captivated by fashion magazines and September issues, and dreaming of...I'm not sure what exactly. Maybe the *life* that those clothes represented, more than the clothes themselves. These days as (capital F) Fashion seems to keep ratcheting up the extremes (Volume! Color! Instagram Bait!) I'm less inspired by the glossy mags and more by what I'm seeing women wearing on Pinterest and other blogs. I've never been hooked by the September issue although the documentary was fascinating. 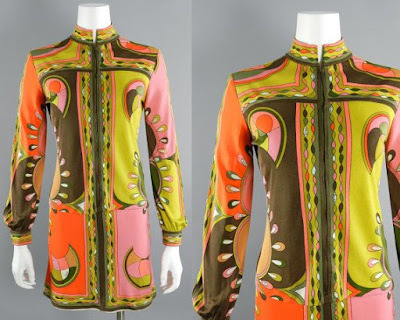 Love that Pucci tunic, what beautiful colours and patterns. Thanks for sharing this. MMe Là-bas: Oh yes, and I ate it up! I was fascinated by how much all this counts to Vogue. re your daughter's blouse: piecrust collars were classic Diana. Lynn L: I've thought that they really don't care about the September articles, they have long seemed slapdash. Maria: Like you, fashion mags are usually hair salon, etc. reads; September Vogue is a different thing to me, embedded with nostalgia. But then I wonder why I did it, kind of like a banana split. Marina: Thank you for your welcome, it's wonderful to be in touch with so many interesting women. LauraH: My friend remembers accompanying her mother to pick up Paris purchases- I don't think couture but there were alterations involved, and standing in the shops with her hands carefully folded so she did not stroke the gorgeous fabrics. lagatta: You bring up an interesting point; these "reincarnations" seem abundant at the highest price points. I wonder why? Marie Claire Bis (but only the Bis editions) were the absolute best. sensitive poet: I am finding more pulse-raising but actually wearable possibilities in those Guardian features that show various ages in more or less affordable clothes. Do you like them? Northmoon: High end house/garden/decor mags share the same DNA, aspirational and sometimes completely over the top styling. I swoon over Venetian palazzos with custom furniture. Leslie Milliagn: Fun pary and great outfit! Could you wear those platforms for the duration? A friend's husband has not changed his glasses frames since the '70s. Yup, aviators. Une femme: Dreaming of "the Life", yes, and my GFs and I wanted to look like Twiggy or Jean Shrimpton despite very, very few of us having the genetic predisposition. and similar. Just go to Lifestyle> Fashion and look around. I did pick up a bit of a magazine habit over the years, once I had a bit of money, but Vogue really only attracted my curiosity and then attention once I entered the blogging world. I came to see the aspirational appeal (but always with a troubled class awareness I just can't shake), and I was favourably impressed by the high quality of the writing (and editing! one of the last places where it's rare to find a spelling, grammatical, or typographical error). I even got to picking up a copy most months, almost working my way through each issue. But especially with our move to a smaller space, I don't know that I've bought a single magazine in the past two or three years. Makes me a bit sad, really, another of those lifelong practices evaporating behind me. . . Sorry, my comment's long than I meant it to be, and I've gone off on a bit of a tangent. I did love picturing your mother bringing a copy of Vogue to you at summer camp. . . .
materfamilias: I enjoyed your anecdote. How those magazines, even the quite prim Seventeen, fanned desires! I agree about the writing and especially liked Joan Juliet Buck. But now I feel enervated by all this and can get cranky about the impossible prices of so much in Vogue and the NYT "T" style pieces. Then thereis the sameness of InStyle "celebrities" and the prescriptive nature of even some newspapers. Much prefer seeing real women and here in Montreal there is always such a vibrant display. I do enjoy The Gentlewoman and will shell out for the issues; at only two per year it doesn't feel like a waste. this is late comment, so I don't know if you will read it. That IS Faye Dunaway in that ad not a look alike. The September Vogue did not thrill me, an isolated item here and there that appealed, the editorials less appealing than the ads. That is disturbing in and of itself. Perhaps I have just gotten old. Was it this out of touch when I was younger, or was I just dreaming of a life I couldn't have and blinded by desire? I think I always struggled with that dichotomy between high-fashion and "boring" reality. It isn't that way of course, and the internet has helped. But the magazines are something else entirely. I do like The Gentlewoman. I looked at the WSJ fall fashion magazine, because my mom had it when I visited. I was more inspired by what I saw in there than by Vogue; just as outrageously expensive, but things that I can imagine real women wearing without looking or feeling like fools. Mardel: So many of us dreamed of a life, perhaps one we "couldn't have". but also, to be gentler to our teenaged selves, we simply did not know might happen. Vogue ca. the early '60s was not going to show what might wear to teach snuffly third-graders, or take care of a family. The best those magazines mustered then were "career girl" features, advice on your core wardrobe for working in an office. Of course that involved hose, heels and girdles! I like how The Gentlewoman often photographs women in their own clothes or at least accessories and avoids trends or the outrageous. The clothes shown are often expensive too, but presented in a more realistic way and I can use the general ideas even when I have to drop the price point.